Our rating: one lava lamp. "Tell me the truth, Doctor. What a difference three years can make. The original Halloween was a suspense masterpiece, a wonderful example of how modern horror could be pared down to its most primal elements: innocent victims, a knife-wielding maniac with no personality, a suburban setting. Three years later, most of the makers of that landmark film reunited to make a direct sequel. That sequel, Halloween II, takes place on the very same night as Halloween, but has none of the style or appeal of the original. Perhaps the worst thing about the Halloween II is the change that Michael Myers has gone through since the original. Probably under the influence of the popular Friday the 13th of the year before, Michael is no longer the single minded, single-weaponed killer that was so effective in the previous movie. Now he has to kill people with a veritable armory of weapons, some of which seem pretty silly -- particularly the hot tub. We just have a tough time taking a film seriously when the killer murders somebody with a hot tub. 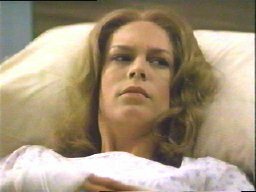 Most of Halloween II takes place in the hospital to which Laurie Strode (Jamie Lee Curtis) is shuttled after the events of Halloween. This large hospital has an amazingly small staff, consisting of one doctor, three nurses, two paramedics, and a bumbling security guard. Equally oddly, there seem to be no patients other than Laurie herself and the occasional Halloween emergency room patient. (Was that razor blade scene really necessary?) And judging by the dimness of the lighting, the Haddonfield hospital hasn't paid their electric bill in some time. But the jacuzzi works just fine! Meanwhile, Dr. Loomis begins to search for Michael Myers, who, after being shot six times and falling out of a second-story window, got up to continue his evening of fun. 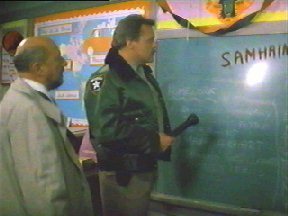 While tracking the Shatner-masked sociopath, Loomis discovers that Myers has written "Samhain" in blood on a wall. This leads Loomis into a long rambling diatribe about the Druids. The poor Druids -- they get blamed for everything, and we really don't know anything about them. What we do know about them was written by ancient Roman historians, who were rather biased against anyone who wouldn't submit to Caesar. More than likely, they weren't nearly as bloodthirsty as their reputation, and they certainly had nothing in common with the modern "Druids" who dress up in robes and worship at Stonehenge every summer solstice. Loomis suggests that Michael Myers' killing spree was inspired by the Druids, who are several centuries away from being able to defend themselves. Not only is this a rather silly development, but it adds a touch of Gothic horror to a story that was doing just fine by eschewing Gothic horror entirerly. blood, but isn't his penmanship terrific?" Eventually, of course, Michael shows up at the hospital and the mayhem begins. Each of the hospital employees and other unfortunates who stumble upon the scene dies an ugly death, usually after receiving a "false scare" in the form of a jumping cat. Laurie finally wakes up from her slumber and is free to run around the darkened hospital corridors, trapped inside with Michael and his choice of deadly medical instruments. Somewhere in there we learn that Laurie is Michael's sister, adopted by the Strode family to keep her safe. Dr. Loomis finally shows up with his trusty sidearm to blow Michael away once again. Is there really much more you need to know? Is it any wonder that the next Halloween film had nothing to do with Michael Myers? At the end of this film, we were almost convinced that Myers had slashed his last teenager, and with our blessings. Fortunately, Halloween 4 breathed some new life into the Myers story, just in time for Halloweens 5 & 6 to ruin it again. Like Myers himself, this movie franchise just won't die, and it inflicts all sorts of pain upon its victims each time it returns. This review is © copyright 1998 Chris Holland & Scott Hamilton. Blah blah blah. Please don't claim that it's yours blah blah, but feel free to e-mail it to friends, or better yet, send them the URL. To reproduce this review in another form, please contact us at guys@stomptokyo.com. Blah blah blah blah. *An interesting sidenote: Jamie Lee Curtis' name is spelled wrong on the video sleeve of our copy of this film. Twice. ** He did, however, finally die in 1995. Unlike Michael Myers, he has yet to rise from the dead and stalk anybody.